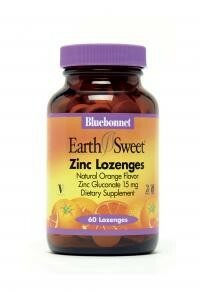 Bluebonnet’s EarthSweet® Zinc 15 mg Lozenges provide 15 mg of zinc gluconate and 100 mg of vitamin C from L-ascorbic acid and sodium ascorbate. Sweetened with EarthSweet®, the industry's first all natural sweetening mix of juice concentrates (wild blueberry, cranberry, strawberry, grape, raspberry, and bilberry fruits, grape seed and raspberry seed extracts) and cane crystals and is flavored with natural oranges and powdered orange juice. Available in great tasting orange lozenge form for maximum assimilation and absorption.